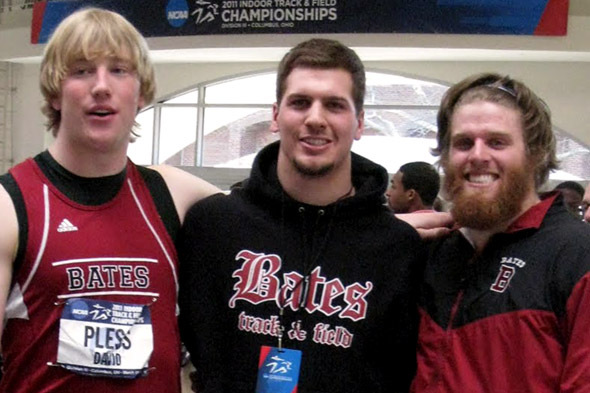 Portland Press Herald sports columnist Steve Solloway writes about Bates’ three new track and field All-Americans: David Pless ’13, Ethan Waldman ’11 and Chris Murtagh ’11. Pless is the new NCAA Division III indoor champion in the shot put. Waldman placed sixth at the national meet in that event. Murtagh was sixth in the 35-pound weight throw. Solloway notes that “their story could end” with their athletic achievement, but the three throwers “have a back story that begins in sorrow.” That involves the late Joe Woodhead, the legendary Bates throwing coach who died in October from a heart attack at age 76. “He cared about the athlete,” said Pless. “If you respected him, you got the respect back. I could feel him [at the national meet in Columbus, Ohio]. When I stood in the circle, he was the wind beneath my feet.” View story from The Portland Press Herald, March 25, 2011.